Updated after 23 league games. Look at the gap between us and Watford. This is the job that Ole has done. Sorry, Pogue, for the delay. I must have missed that. 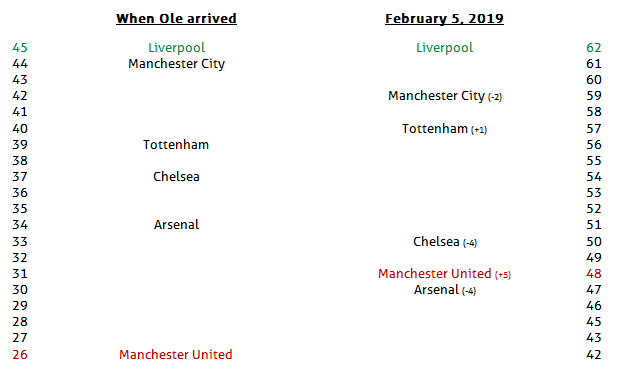 Tottenham's wobble really hasn't cost them that much, Arsenal and Chelsea however seem to have been in free fall since Ole took over. Arsenal's wobble looks the best. And imagine what it would have looked like, had they lost to Chelsea at the weekend. Disaster. The difference between both tables. After 15 games we were so clearly and visibly mid-table, cut off from top 5 and closer to the bottom than to the top. 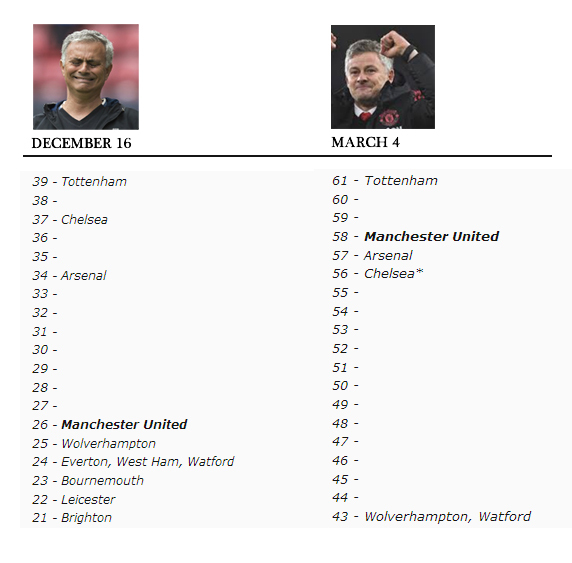 Only 6 games with Ole and we’re now firmly in the leading peloton, close to breaking into the top 4. What a turnaround! Now I know why I prefer this table, I always enjoyed mountain stages of Tour de France and how the distance and time gaps looked was always presented on TV. After 25 games (with Liverpool and West Ham on 24 games). So when Mourinho was fired, we were 13 points off 3rd, 11 points off 4th, 8 points off 5th and one point above 7th placed team. Brilliant by Ole. I’m equally as impressed with spurs keeping themselves within touching distance with the circus show of injuries they’ve got going on. Most teams are where they are expected to be in the table based on the quality of players they have. City and Liverpool rightly in the top 2. Spurs, Chelsea and United have comparable squads. Arsenal a level below the others. Then we have the next tier of teams. Wolves, Everton, West Ham, Leicester and Bournemouth. All these teams have 4-5 quality players. Watford maybe are a bit weaker in overall quality than the above teams but have done really well. Then we have the bottom tier of teams with low levels of investment in the squad with the exception of Fulham. Crystal Palace also lower in the table than their sqaud quality. That makes for a really nice graphic! Well done! Not good reading if you are a Terriers fan. That is a lot of space to Cardiff, never mind safety! I don't even remember it, but it looks like I've always enjoyed such a way of presenting the league table. 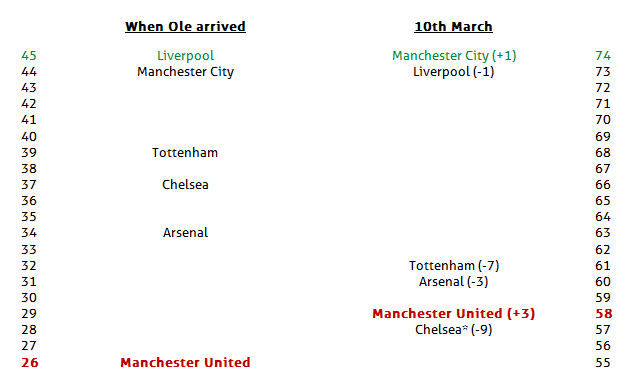 February 2013, Fergie's last season, after 25 games. It may take a few seconds before you find Liverpool. Let's present the table like that. By the way, top teams have improved over the last seasons as you can see how long gaps there are between them. Liverpool have an amazing season, but City and Tottenham aren't without any chances. 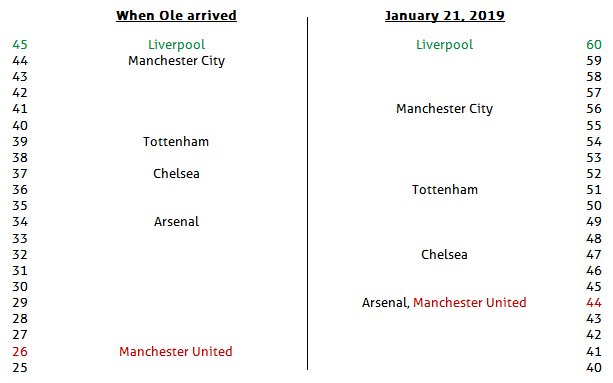 We didn't have much competition that season when you look at the distance between us and City in 2013. Not to mention how far Chelsea, Tottenham, Everton (!) and Arsenal were. That table and this table next to each other should be interesting. It must be the worst presentation of a league table I've ever seen. It's about as good as The Mirror gets. No way, I was told 7 weeks ago that 4th was impossible! Unfrtunately the season starts in August and football didn't begin in 1992. Thanks, I've been out for some time. 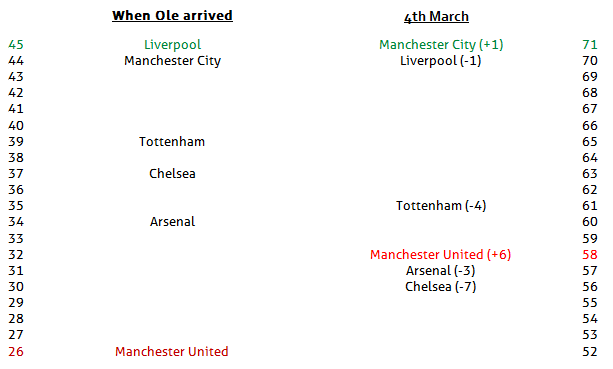 I'll prepare one more later today showing our progress since Ole's return. I made this, taking Spuds as a reference.